A shape layer has two components: a fill and a shape. The fill properties determine the color (or colors), pattern, and transparency of the layer. The shape is a layer mask that defines the areas in which the fill can be seen and those areas in which the fill is hidden. In the blue layer you've just created, the fill is your dark blue color. The color is visible in the upper part of the image, within the shape you drew, and is blocked in the lower part of the image so that the gradient green can be seen behind it. In the Layers palette for your poster file, you'll see a new layer, named Shape 1, above the Background layer. There are three items represented along with the layer name: two thumbnail images and an icon between them. 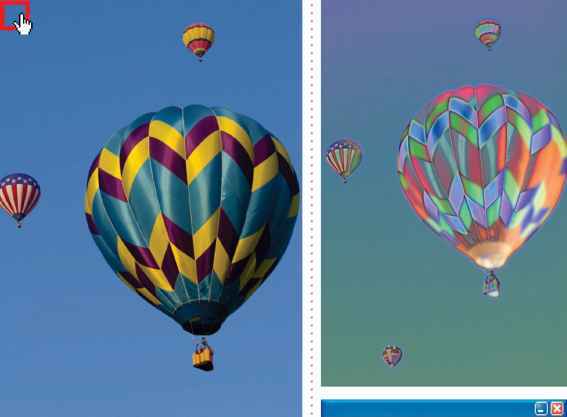 The left thumbnail shows that the entire layer is filled with the deep blue foreground color. The small slider underneath the thumbnail is not functional but symbolizes that the layer is editable. The thumbnail on the right shows the vector mask for the layer. In this thumbnail, white indicates the area where the image is exposed, and black indicates the areas where the image is blocked. The icon between the two thumbnails indicates that the layer and the vector mask are linked.